[Feature] A List of All the “New” Games Nintendo Switch has to Offer and There’s a lot of Them! Even though the Nintendo Switch is a console that has multiple games on it every week, there are still those who state the Switch has no more games and do you know what we say to that? No more! You’ve Got Mail! – Released Exclusively on Nintendo Switch in Japan on September 28th 2017 (No plans for a Western release have been shared at this time. 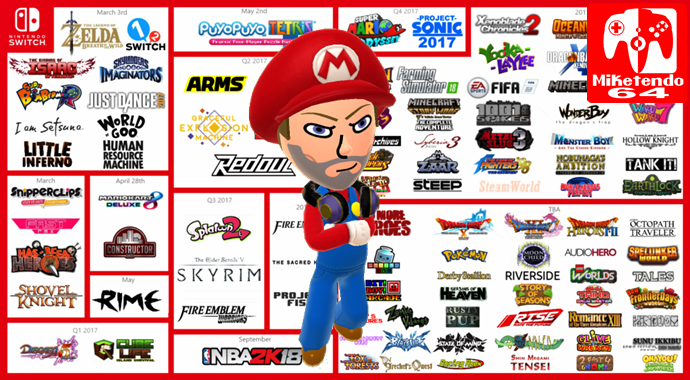 Given the number of games that are out on Switch, it is very likely we may have missed a game or two, but those listed above are the games we feel met our requirements and as you can see for yourself, there are over 70 of them listed, so if the Switch has no games like it has been stated many times over, I think our evidence above rebukes that notion. However, although we did put quite a bit of time into compiling this list, we harbour no desires at this time to continue it, as we feel we have proved our point. That being said though, if you, our readers feel this list is something you would like to see us add to over the coming months, feel free to let us know and as always, thank you for reading.